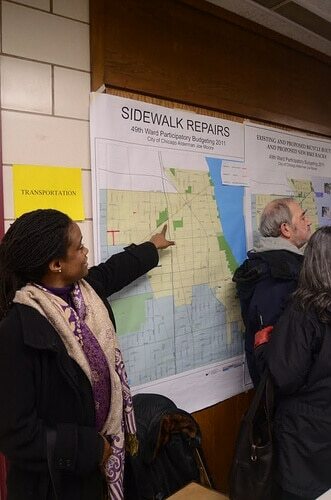 Discussing proposals at a 49th Ward participatory budgeting meeting in 2011. Photo from StreetBlog Chicago by John Greenfield. Chicago was the first significant participatory budgeting programme in the USA. Under the guidance of Alderman Joe Moore, who was also a participant on a learning exchange to the UK in 2013 that spurred on new PB work in Scotland it has expanded and become more structured, and there is now a well developed website for the Chicago programme. PB Chicago (PBC) is an innovative initiative that lets communities decide how to spend millions of tax dollars. Through a participatory budgeting (PB) process, discretionary capital funds controlled by Aldermen (“menu money”) are allocated by the community. Ward residents and stakeholders will propose spending ideas and develop project proposals, residents will vote on projects, and the list of projects that receive the most votes will be submitted to the Alderman and then the City for implementation. In the 2013-14 cycle, Aldermen Arena, Moore and Muñoz, UIC’s Great Cities Institute (GCI), the Participatory Budgeting Project (PBP) and several city-wide and community based organization partnered to implement PB in Chicago communities so that local residents can determine how to spend millions in taxpayer money. PB Chicago is beginning their fourth cycle with eight Aldermen giving their residents an opportunity to make real decisions about real dollars! They’ve been working all summer to help these communities prepare to roll out a grassroots democratic process for another year. Stay tuned into the Chicago PB website for more details on the upcoming Idea Collection meetings and Neighborhood Assemblies. The website also includes a wide range of other resources and information, including videos, media reports and more.